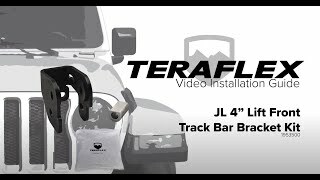 The TeraFlex JL/JLU: Front Track Bar Axle Bracket Kit corrects steering geometry on JL/JLU Wrangler models with 4.5” lift kits to eliminate bump steer and other front-end issues. Bolt-on bracket mounts to the front axle. I put this on my JL and the track bar makes a popping noise and sometimes a squeaking sound. I have tighten this down so many times but the issue is that the nut connecting the track bar bolt is such a tight fit its almost impossible to get a wrench on it with out it spinning. Seems like a poor design.